Friends do crazy things for each other, even if it calls for fibbing once in a while, and those fibs just get bigger and bigger as time goes on making for some funny and/or awkward situations. Colonial Players of Annapolis’ latest offering, Rumors by Neil Simon, Directed by Atticus Cooper Boidy, gives us a glimpse into the lives of a group of friends who are trying to protect another friend (and themselves) from scandal with lies and deceit that turns one evening into a farcical comedy that will have you slapping your knee all night. In a nutshell, Rumors is about a group of wealthy friends who are gathering to celebrate the 10th wedding anniversary of Charlie, the Deputy Mayor of New York City, who just happened to have shot himself, and Myra, his missing wife. The shot, however, was only a flesh wound, and only one couple, Chris and Ken Gorman, was there to hear the shot and lend aid. As the other three couples arrive, Claire and Lenny Ganz, Ernie and Cookie Cusack, and Glenn and Cassie Cooper, everyone is trying to get the real story of what happened to Charlie and run about in a sea of lies and mis-communication. The only drawback of this production is the space. Set Design by Directory Atticus Cooper Boidy is, indeed, impeccable, but trying to stage a farce in the round is no small feat. There are doors to be slammed, and numerous entrances and exits and it can be daunting to design and stage all of this in the round. Boyd’s design does have all the doors, entrances, and exits and he has managed to stage this production nicely, but the wide space seems to hinder the quick action that’s required of a farce. An actor has to cross what seems like the Red Sea to get to his or her exit and it just takes away from the urgency of the action. Regardless, Boyd, with his Set Design has managed to put us in this upscale residence with a sleek, modern design and set pieces that work beautifully with this production. Kirsti Dixon’s Costume Design is on point in this production, choosing attire that represents a wealthy group of folks coming together for an evening. 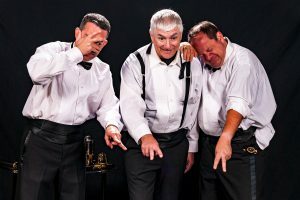 Men in tuxedos and women in dresses and gowns give the feeling of a more formal gathering and it adds to the comedy when things start to go awry and the coats come off, sleeves get rolled up, and shoes come off. It’s a modern piece and Dixon has managed to create a terrific, authentic look for the characters in this piece. Again, directing a farce is no easy task but Director Atticus Cooper Boidy has a good grasp on the material and how it is to be presented. To reiterate, the only drawback is the space and how it takes away from the frenzy that is needed for this type of show. He understands these characters and the comical situation and his staging, for the most part, is superb. His casting is near perfect and the story is told nicely without many hiccups. Overall, a job quite well done by Boyd. 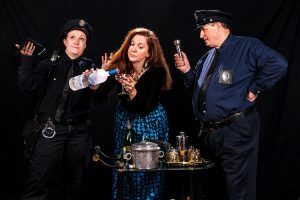 Moving into the performance aspect of this piece, playing more supporting roles are Stephanie Bernholz as Officer Pudney and John Purnell as Officer Welch. Though these two enter toward the end of the story, they make a good impression on the audience. Purnell is believable and even likeable as the officer in charge trying to get the real story of what’s going on. Pudney, as the quiet, but observant partner, plays the role more suspicious and it works beautifully against Purnell’s more lax character. Glenn Cooper, a rising political star, is portrayed by Kevin McConnell and, though he seems to have a good understanding of his character and his actions, the performance fell a bit flat and subdued. He doesn’t exude the kind of urgency that is called for and if he just loosens up, just a bit, his performance may not sound so scripted. However, Rosalie Daelemans takes on the role of Cassie Cooper, a discontented wife and fan of mystical powers, and though she seems scripted much of the time, as well, she is more at ease with her character giving a good showing. Glenn Singer takes on the role of Ernie Cusack, a kind hearted, calm analyst, and Amy E. Haynes portrays Cookie Cusak, a popular television chef. Singer does a terrific job portraying the calm side of Ernie, but when it comes to the frantic, frenzied side, Singer falls a little short, but he still gets the point across and has a good grasp of his character. Haynes is a standout in her portrayal of Cookie giving a natural delivery of the text and embodying the character. Haynes’ accent was a little confusing at first (going from what I heard was a “Jersey girl” to a “Southern belle”) but she evened it out quickly and gave a genuine and funny performance with great comedic timing. We first meet the Gorman’s with Shannon Benil taking on the role of Chris Gorman and Dann Alagna portraying Ken Gorman and both of these actors set just the right mood for the entire piece. Dann Alagna understands the material well and gives an energized performance that sets the bar for the rest of the production. His timing is superb and his delivery is natural making him a highlight of this piece with a strong presence and performance. Benil works well off of and with Alagna but seems, at times, subdued giving us wide eyes and an agape mouth instead of frenzied movement, but that very well could be a directorial choice. She plays her character well and gives a strong, confident performance, overall. Finally, we have the pleasure of meeting Clair and Lenny Ganz, played by Mary C. Rogers as and Brian Binney, respectively. Rogers is splendid as Mrs. Ganz, giving just enough shade and sassiness as the character requires and her comedic timing is near faultless, having a knack spitting out those famous Neil Simon one-liners without a wince. Brian Binney, however, is the standout in this production with impeccable comedic timing and a total understanding of the material and style of this piece. His character work is impressive and consistent and he has a solid, assured presence on the stage that adds value to his performance and to the production as a whole. Kudos to Binney for a job well done. 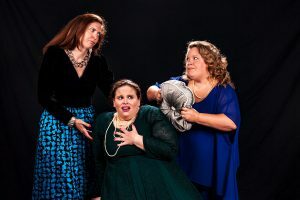 Final thought… Rumors is delightful, funny romp through an evening of miscommunication and straight up lies (all for the good of the whole, of course). Most of the performances are spot on and the staging is good, save a few spacing issues, that is of no fault to anyone. It’s a high energy show that will keep you engaged and interested throughout. The late, great Neil Simon gives us a script that is just as witty as ever and the production, as a whole, is not one you want to miss this season. 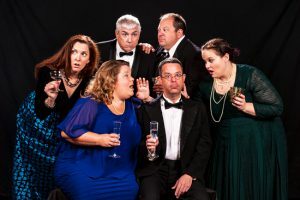 This is what I thought of Colonial Players’ production of Rumors… What did you think? Please feel free to leave a comment! Rumors will play through September 29 at Colonial Players of Annapolis, 108 East Street, Annapolis, MD. For tickets, call 410-268-7373 or purchase them online.